Serving long-term at a mission hospital takes a village of helpers. 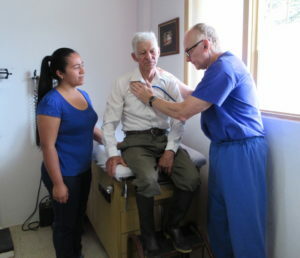 This is what Dr. Albert Exner, a family practice physician currently serving in Ecuador, has learned over his years of service. There are family, friends, and supporters. 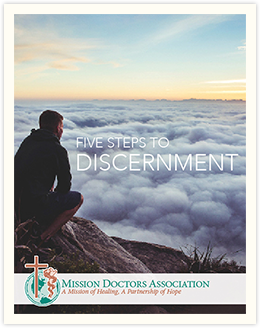 A doctor serving at a mission clinic or hospital does not go alone. Donors like you make all the difference – YOU make Dr. Exner’s mission possible. Imagine traveling hours by foot in rural conditions, often in heat or rain. You are heading to a doctor who can treat you, but you may need to make a much longer trip because you’ve arrived at a clinic. That was the case for many years in the area where Albert is now serving. But thanks to donors like you and the dedication of the local Catholic Church, there have been changes to the facility that have expanded the care that can be provided here. On a recent visit with longtime friend of Mission Doctors, Dr. Bill Eddy, I took the opportunity to ask him how he originally learned about the work of MDA. Bill told me that in the early 1960’s, there was a large active group of Catholic Doctors in Long Beach that met every month in support of the work of Mission Doctors and they often heard from our founder, Msgr. Anthony Brouwers. Bill said when it came time for the annual Auxiliary Gala, the group would hire a bus and he and his wife Joan would join the group to celebrate the life-saving work at a venue in Los Angeles. It was always a special evening out for the parents of seven! Looking to improve your photography? We’ve created a free ebook with tips to help! We were lucky enough to have contributions from Michael Paluska, an Emmy Award-winning journalist. Michael has been a reporter since 2006, both behind the camera and in front of it, and he gave us his very best advice. Doctors and their spouses considering short-term service are invited to attend a Retreat/Seminar at Loyola University Stritch School of Medicine. Take the time to re ect on God’s call to ‘heal the sick’ and discuss the practical issues of mission service and obtain CME credits for attending. In recognition of the dedicated work of Catholic Health Care Professionals, the Archdiocese of Los Angeles and Mission Doctors Association invites all Catholic medical professionals to the celebration of a Annual Mass at Cathedral of Our Lady of the Angels. Visit www.CatholicWM.org for more details.